And strike it does. For in Harry's second year at Hogwarts, fresh torments and horrors arise, including an outrageously stuck-up new professor, Gilderoy Lockheart, a spirit named Moaning Myrtle who haunts the girl's bathroom, and the unwanted attentions of Ron Weasley's younger sister, Ginny. 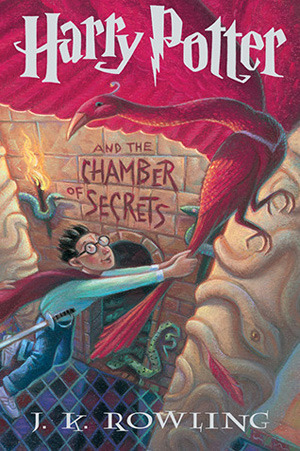 NOTE: July 2013 marks my “Gosh I don’t know how many times I have read this book” annual Re-Read of Harry Potter and the Chamber of Secrets! I will be changing all my ratings of this series to 5 because I have come to the conclusion that if I can re-read them this many times they are worthy of a 5! Audiobook Thoughts: I love Jim Dale’s narration but I sure would love to have Stephen Fry’s version too! Who doesn’t love HP? I mean honestly? I did love the way Jim Dale read these books. And I am totally with you on Snape. The first read through is truly a remarkable gift that will stay with me for LIFE. That’s how you know you’ve read a book that will change the world. Love this book/audio! Btw, have you seen the new artwork? I think it’s fab (although I enjoy the old artwork as well!). Is there anyone who doesn’t like this series? I think it appeals to everyone! Lockheart is really funny to read. In my first reading I really thought he was pure evil, especially by the way he treated people, but now I just realize he’s another guy wanting a easy life and fame. I agree — a book that’s worthy of a re-read is definitely a 5-star book! I think Gilderoy Lockheart was one of my favorite characters. So narcissistic, such a great con artist! !